Hans Christian Andersen first published this short story in 1830. It's about the consequences of loneliness after a boy gifts a pewter soldier to an old man. In the street, up there, was an old, a very old house--it was almost three hundred years old, for that might be known by reading the great beam on which the date of the year was carved: together with tulips and hop-binds there were whole verses spelled as in former times, and over every window was a distorted face cut out in the beam. The one story stood forward a great way over the other; and directly under the eaves was a leaden spout with a dragon's head; the rain-water should have run out of the mouth, but it ran out of the belly, for there was a hole in the spout. All the other houses in the street were so new and so neat, with large window panes and smooth walls, one could easily see that they would have nothing to do with the old house: they certainly thought, "How long is that old decayed thing to stand here as a spectacle in the street? And then the projecting windows stand so far out, that no one can see from our windows what happens in that direction! The steps are as broad as those of a palace, and as high as to a church tower. The iron railings look just like the door to an old family vault, and then they have brass tops--that's so stupid!" On the other side of the street were also new and neat houses, and they thought just as the others did; but at the window opposite the old house there sat a little boy with fresh rosy cheeks and bright beaming eyes: he certainly liked the old house best, and that both in sunshine and moonshine. And when he looked across at the wall where the mortar had fallen out, he could sit and find out there the strangest figures imaginable; exactly as the street had appeared before, with steps, projecting windows, and pointed gables; he could see soldiers with halberds, and spouts where the water ran, like dragons and serpents. That was a house to look at; and there lived an old man, who wore plush breeches; and he had a coat with large brass buttons, and a wig that one could see was a real wig. Every morning there came an old fellow to him who put his rooms in order, and went on errands; otherwise, the old man in the plush breeches was quite alone in the old house. Now and then he came to the window and looked out, and the little boy nodded to him, and the old man nodded again, and so they became acquaintances, and then they were friends, although they had never spoken to each other--but that made no difference. The little boy heard his parents say, "The old man opposite is very well off, but he is so very, very lonely!" "I say, master! will you give this to the old man over the way from me? I have two pewter soldiers--this is one of them, and he shall have it, for I know he is so very, very lonely." And the brass balls on the iron railings shone much brighter than ever; one would have thought they were polished on account of the visit; and it was as if the carved-out trumpeters--for there were trumpeters, who stood in tulips, carved out on the door--blew with all their might, their cheeks appeared so much rounder than before. Yes, they blew--"Trateratra! The little boy comes! Trateratra!" --and then the door opened. The whole passage was hung with portraits of knights in armor, and ladies in silken gowns; and the armor rattled, and the silken gowns rustled! And then there was a flight of stairs which went a good way upwards, and a little way downwards, and then one came on a balcony which was in a very dilapidated state, sure enough, with large holes and long crevices, but grass grew there and leaves out of them altogether, for the whole balcony outside, the yard, and the walls, were overgrown with so much green stuff, that it looked like a garden; only a balcony. Here stood old flower-pots with faces and asses' ears, and the flowers grew just as they liked. One of the pots was quite overrun on all sides with pinks, that is to say, with the green part; shoot stood by shoot, and it said quite distinctly, "The air has cherished me, the sun has kissed me, and promised me a little flower on Sunday! a little flower on Sunday!" And then they entered a chamber where the walls were covered with hog's leather, and printed with gold flowers. "The gilding decays, But hog's leather stays!" And there stood easy-chairs, with such high backs, and so carved out, and with arms on both sides. "Sit down! sit down!" said they. "Ugh! how I creak; now I shall certainly get the gout, like the old clothespress, ugh!" "I thank you for the pewter soldier, my little friend!" said the old man. "And I thank you because you come over to me." "Thankee! thankee!" or "cranky! cranky!" sounded from all the furniture; there was so much of it, that each article stood in the other's way, to get a look at the little boy. In the middle of the wall hung a picture representing a beautiful lady, so young, so glad, but dressed quite as in former times, with clothes that stood quite stiff, and with powder in her hair; she neither said "thankee, thankee!" nor "cranky, cranky!" but looked with her mild eyes at the little boy, who directly asked the old man, "Where did you get her?" "Yonder, at the broker's," said the old man, "where there are so many pictures hanging. No one knows or cares about them, for they are all of them buried; but I knew her in by-gone days, and now she has been dead and gone these fifty years!" "They say at home," said the little boy, "that you are so very, very lonely!" "Oh!" said he. "The old thoughts, with what they may bring with them, come and visit me, and now you also come! I am very well off!" Then he took a book with pictures in it down from the shelf; there were whole long processions and pageants, with the strangest characters, which one never sees now-a-days; soldiers like the knave of clubs, and citizens with waving flags: the tailors had theirs, with a pair of shears held by two lions--and the shoemakers theirs, without boots, but with an eagle that had two heads, for the shoemakers must have everything so that they can say, it is a pair! Yes, that was a picture book! The old man now went into the other room to fetch preserves, apples, and nuts--yes, it was delightful over there in the old house. "I cannot bear it any longer!" said the pewter soldier, who sat on the drawers. "It is so lonely and melancholy here! But when one has been in a family circle one cannot accustom oneself to this life! I cannot bear it any longer! The whole day is so long, and the evenings are still longer! Here it is not at all as it is over the way at your home, where your father and mother spoke so pleasantly, and where you and all your sweet children made such a delightful noise. Nay, how lonely the old man is--do you think that he gets kisses? Do you think he gets mild eyes, or a Christmas tree? He will get nothing but a grave! I can bear it no longer!" "You must not let it grieve you so much," said the little boy. "I find it so very delightful here, and then all the old thoughts, with what they may bring with them, they come and visit here." "Yes, it's all very well, but I see nothing of them, and I don't know them!" said the pewter soldier. "I cannot bear it!" The carved trumpeters blew, "Trateratra! There is the little boy! Trateratra!" and the swords and armor on the knights' portraits rattled, and the silk gowns rustled; the hog's leather spoke, and the old chairs had the gout in their legs and rheumatism in their backs: Ugh! it was exactly like the first time, for over there one day and hour was just like another. "I cannot bear it!" said the pewter soldier. "I have shed pewter tears! It is too melancholy! Rather let me go to the wars and lose arms and legs! It would at least be a change. I cannot bear it longer! Now, I know what it is to have a visit from one's old thoughts, with what they may bring with them! I have had a visit from mine, and you may be sure it is no pleasant thing in the end; I was at last about to jump down from the drawers. "I saw you all over there at home so distinctly, as if you really were here; it was again that Sunday morning; all you children stood before the table and sung your Psalms, as you do every morning. You stood devoutly with folded hands; and father and mother were just as pious; and then the door was opened, and little sister Mary, who is not two years old yet, and who always dances when she hears music or singing, of whatever kind it may be, was put into the room--though she ought not to have been there--and then she began to dance, but could not keep time, because the tones were so long; and then she stood, first on the one leg, and bent her head forwards, and then on the other leg, and bent her head forwards--but all would not do. You stood very seriously all together, although it was difficult enough; but I laughed to myself, and then I fell off the table, and got a bump, which I have still--for it was not right of me to laugh. But the whole now passes before me again in thought, and everything that I have lived to see; and these are the old thoughts, with what they may bring with them. "Tell me if you still sing on Sundays? Tell me something about little Mary! And how my comrade, the other pewter soldier, lives! Yes, he is happy enough, that's sure! I cannot bear it any longer!" "You are given away as a present!" said the little boy. "You must remain. Can you not understand that?" The old man now came with a drawer, in which there was much to be seen, both "tin boxes" and "balsam boxes," old cards, so large and so gilded, such as one never sees them now. And several drawers were opened, and the piano was opened; it had landscapes on the inside of the lid, and it was so hoarse when the old man played on it! and then he hummed a song. "Yes, she could sing that!" said he, and nodded to the portrait, which he had bought at the broker's, and the old man's eyes shone so bright! "I will go to the wars! I will go to the wars!" shouted the pewter soldier as loud as he could, and threw himself off the drawers right down on the floor. What became of him? The old man sought, and the little boy sought; he was away, and he stayed away. "I shall find him!" said the old man; but he never found him. The floor was too open--the pewter soldier had fallen through a crevice, and there he lay as in an open tomb. That day passed, and the little boy went home, and that week passed, and several weeks too. The windows were quite frozen, the little boy was obliged to sit and breathe on them to get a peep-hole over to the old house, and there the snow had been blown into all the carved work and inscriptions; it lay quite up over the steps, just as if there was no one at home--nor was there any one at home--the old man was dead! Some days afterwards there was an auction at the old house, and the little boy saw from his window how they carried the old knights and the old ladies away, the flower-pots with the long ears, the old chairs, and the old clothes-presses. Something came here, and something came there; the portrait of her who had been found at the broker's came to the broker's again; and there it hung, for no one knew her more--no one cared about the old picture. In the spring they pulled the house down, for, as people said, it was a ruin. One could see from the street right into the room with the hog's-leather hanging, which was slashed and torn; and the green grass and leaves about the balcony hung quite wild about the falling beams. And then it was put to rights. "That was a relief," said the neighboring houses. A fine house was built there, with large windows, and smooth white walls; but before it, where the old house had in fact stood, was a little garden laid out, and a wild grapevine ran up the wall of the neighboring house. Before the garden there was a large iron railing with an iron door, it looked quite splendid, and people stood still and peeped in, and the sparrows hung by scores in the vine, and chattered away at each other as well as they could, but it was not about the old house, for they could not remember it, so many years had passed--so many that the little boy had grown up to a whole man, yes, a clever man, and a pleasure to his parents; and he had just been married, and, together with his little wife, had come to live in the house here, where the garden was; and he stood by her there whilst she planted a field-flower that she found so pretty; she planted it with her little hand, and pressed the earth around it with her fingers. Oh! what was that? She had stuck herself. There sat something pointed, straight out of the soft mould. It was--yes, guess! It was the pewter soldier, he that was lost up at the old man's, and had tumbled and turned about amongst the timber and the rubbish, and had at last laid for many years in the ground. "Let me see him," said the young man. He laughed, and then shook his head. "Nay, it cannot be he; but he reminds me of a story about a pewter soldier which I had when I was a little boy!" And then he told his wife about the old house, and the old man, and about the pewter soldier that he sent over to him because he was so very, very lonely; and he told it as correctly as it had really been, so that the tears came into the eyes of his young wife, on account of the old house and the old man. "It may possibly be, however, that it is the same pewter soldier!" said she. "I will take care of it, and remember all that you have told me; but you must show me the old man's grave!" "But I do not know it," said he, "and no one knows it! All his friends were dead, no one took care of it, and I was then a little boy!" "How very, very lonely he must have been!" said she. "Very, very lonely!" said the pewter soldier. "But it is delightful not to be forgotten!" 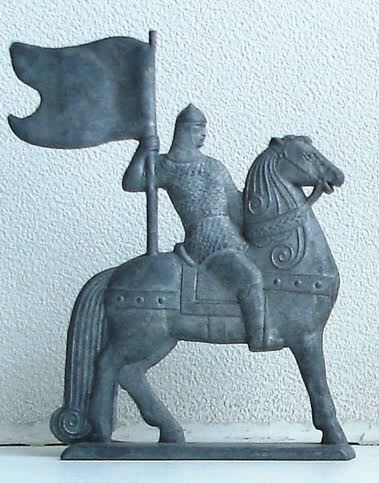 This the pewter soldier did not believe. Add The Old House to your own personal library.